Although joints sometimes make snapping or popping sounds that are nothing to worry about, muscles typically don't. Usually, the sound or sensation of a pop in your calf muscle is a sure sign of a muscle tear. If it's accompanied by a sharp pain that makes you come to a halt, it's likely you're dealing with a pulled muscle. A muscle tear causes a popping sound at the time of injury. Runners are especially prone to calf muscle tears, which occur when too much force is placed on the muscle or the muscle fibers are overstretched. According to clinical physiotherapist John Miller, calf muscle tears frequently occur when runners change direction or increase their speeds suddenly. But, if the circumstances are right, you can tear your calf muscle even at a steady jog. Calf muscle injuries are assessed by their severity and symptoms. There are three calf strain grades. Grade I is a minor injury in which just a few muscle fibers are affected. There is pain at the time of injury, but it is not severe enough to prohibit the runner from continuing to run. Grade II is a more moderate injury, affecting a greater number of muscle fibers. There is more pain at the time of injury, and there may be a loss of muscle function that causes the runner to have to cease running. Grade III is a severe injury, involving a complete tear of the muscle or a separation of the muscle and the tendon that attaches it to bone. The pop that is heard or felt is the actual muscle separating. There is great pain at the time of injury and complete loss of muscle function. Read more: How Soon to Exercise After Calf Muscle Tear? Grade III tears require immediate medical attention. Your doctor or other medical professional will likely ask you if you heard a pop when the injury occurred. This is typically considered the hallmark of a complete muscle tear. In addition, your doctor will examine the muscle to see if the site of the tear is visible or palpable. He may have you do physical exercises to gauge the extent of muscle function, if there is any at all. If he still cannot determine whether there is a complete tear, he may order additional testing such as X-rays, magnetic resonance imaging and ultrasound. Ceasing activity and staying off the leg as much as possible. Applying an ice pack to the calf muscle for 10 to 20 minutes at a time every hour or as often as possible. Wrapping the calf snugly with an elastic bandage. Elevating the calf to or above the level of the heart. Continue this treatment for at least 24 hours after the injury or for as long as your doctor directs. Your doctor will determine what further treatment your pulled calf muscle requires. Surgery is rarely required for calf muscle tears, notes the American Physical Therapy Association. According to Miller, most calf muscle tears naturally heal themselves with collagen scar tissue. This phase can take about six weeks. During this time, the goal should be to lengthen and align the scar, which can prevent another tear in the future. To do this, Miller recommends massage, self-myofascial release (rolling) and stretching. Once you've achieved range of motion and muscle extensibility, you can start to build strength with targeted exercises. Different exercises are appropriate at different stages of healing. Typically in the first stage, you'll work on concentric strength followed by eccentric strength, says Miller. Concentric is when the muscle is contracting, and eccentric is when the muscle is lengthening. For example, calf raises include both concentric and eccentric muscle actions. To perform a concentric calf raise, stand with your heel hanging off a step and rise on to your toes; this causes the calf muscle to shorten. To perform an eccentric calf raise, stand on your toes and lower your heel, which causes the muscle to lengthen. Miller says that because a torn calf muscle can prohibit you from engaging in activity for several weeks, you may need to also focus on strengthening the other muscles of your lower body — in both legs — as well as your core muscles. Only your physical therapist or doctor can tell you when you are ready to start running again. Before that, however, you can benefit from performing some sport-specific exercises that will better prepare you for the physical demands running places on the calf muscle. You can start by simply doing small hops on one foot. Then, you can make those larger, more explosive hops — only if your calf muscle is ready. Other effective exercises to improve power and agility include ladder drills, lateral shuffle, hurdle drills and figure-8 drills. When you do get out for your first few runs, take it slow. You will need to work your way back up to your previous distance and intensity levels, especially if you have been out of the game for a long time. 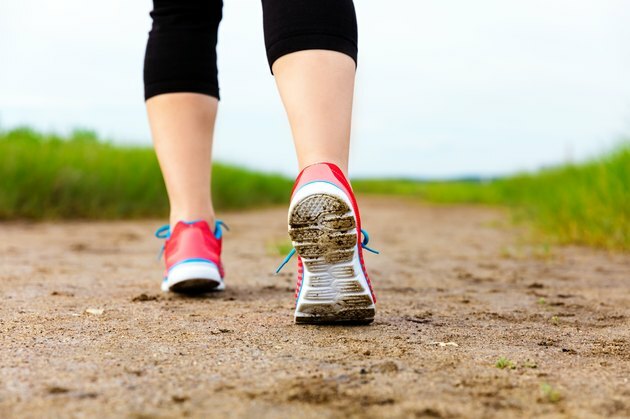 Podiatrist and sports medicine specialist Stephen M. Pribut recommends starting at 30 to 50 percent of your normal mileage in the first week and then increasing to 40 to 60 percent of normal in your second week if your calf muscle is feeling good. By week three, you can go up to 80 percent of your normal mileage and resume 100 percent of your usual mileage by week four. After that, Dr. Pribut says you can very carefully add in some more challenging runs.